While traffic signal synchronization improves traffic flows, its benefits are more pronounced under certain conditions. Typically, synchronization is most beneficial when traffic volumes are high, especially during peak hours. Conversely, late at night, when traffic is light, traffic signals are set to run independently and provide green time to approaching traffic on a first come first served basis. This allows the signal to quickly respond to the light traffic demands. Since the traffic pattern changes throughout the day (due to people traveling back and forth from work / school / shopping etc. 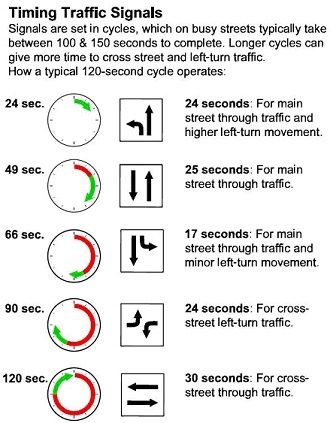 ), sets of different timing plans may be utilized to maintain roadway efficiency with the varying traffic demand (e.g. morning peak, noon and afternoon peak). These plans are developed based on the most recent traffic count data collected. In Irvine, a typical cycle length can range from 60 seconds to 120 seconds, and traffic signal synchronization is typically operated between the hours of 6:00 A.M. and 8:00 P.M.